How many Hagi are enough? After a million and one Yixing topics, I figured it was high time to start a semi official Hagi topic that will hopefully continue to breath and transpire just like our Hagi! Here we can share our hagi ware, discuss issues regarding hagi including: problem solving, our fave Hagi artists, extreme rough sand pieces, etc. And of course ... why Hagi in the first place??? Please continue to post your Hagi in the Show Off mega topic for the general population, but here we can be a little more specific for the cult members of the HFC (Hagi Fan Club). To get the potters wheel rolling, I will sticky the topic. I am not a great fan of Hagiyaki teawares (although I fully understand why someone can be) so I voted 4-5. I wasn't a big Hagi fan either, till I got my first yunomi last year. There is just something special about these pieces, the way they feel in your hand, the details, how they look and smell. I loved watching my work cup that I used every day, slowing begin the crackling glaze. I didn't even mind the sweating and "leaking" which was really no worse than a condensation ring. So I voted - Infinity ... always room for one more in theory that is!! As for storage and practicality, yeah there is a limit. so to infinity and beyond! Victoria wrote: I wasn't a big Hagi fan either, till I got my first yunomi last year. There is just something special about these pieces, the way they feel in your hand, the details, how they look and smell. I loved watching my work cup that I used every day, slowing begin the crackling glaze. I didn't even mind the sweating and "leaking" which was really no worse than a condensation ring. You are noted and quoted as a lover of Oolong. I like the look of some of the Hagi that has been shown, and find others look a bit clumsy. Yet, as others have observed, repeated viewing does tend to make even the clumsier looking ones appear more and more inviting. When I do get round to buying one, how is it best used for oolong? They seem quite large! Does one have to get the smallest possible? And only partially fill it - to prevent the bottom most contents being too cool! Do you actually use it for Green oolongs, and/or would you recommend it for darker DHP? I like the look of some of the Hagi that has been shown, and find others look a bit clumsy. Yet, as others have observed, repeated viewing does tend to make even the clumsier looking ones appear more and more inviting. I agree Herb_Master! Being a potter myself, I know that although each 'artist' has their own style, each creates a unique and different piece every time, with 'their' style evident! I tend to lean more towards the 'clunkier' styles as they to me definately have more pizazz! Especially with those white Deishe that have the heavier glazing and contrasting chocolate colors indented deep into the cup Wow, they are a beauty to behold. However, I do like the smaller ones better, even the ones that are listed as sake cups I seem to like the best. (Pardon me but the name of these cup styles eludes me at this time but I know it starts with a "gu". I am sure someone can fill that name in for you). Reputable sellers will usually have the artist and size listed, along with great pictures to show you all sides! Just take your time til you find what you want. I am anxiously awaiting more pictures everyone! They are unique, each one of even the same style is different. They are like the people of teaware with individual personalities. They look different and will even behave differently. They age, change over time. I will be learning this first hand as a newbie to Hagi. They are relatively uncommon. My tastes have always been drawn to the unusual. They are made by craftsmen, artisans. Not punched out in a factory somewhere. A lot of care goes into each piece making them individually special. You can actually follow different artisans as a result and have faves. They breath and they transpire. How long, I do not know? This feature may turn some people off, but I am loving this. The warm slightly moist feel, it is really quite nice. Some "children" require some extra attention due to early leakage issues. 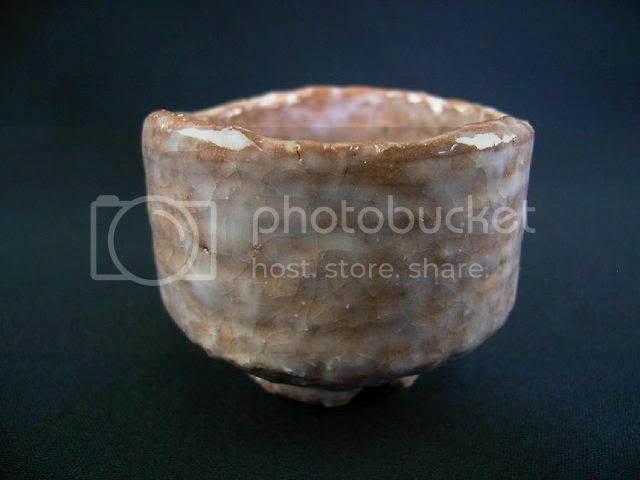 Case and point, this is a Deishi Loquat glaze guinomi (sake cup) from "MAGOKORODO" which I use for a teacup (2.75" wide). It is really beautiful in the eye of this beholder. Since it is made with "extreme rough sand content" (if you look at the picture of its bottom, you will see what I mean) and is new, it is actually leaking ... forming a small puddle on my chataku. I face some options, do nothing and hope time takes care of the leak. Make some rice or corn starch and soak it for 6 hours. For now, I will do nothing, this little gal is going to teach me patience. She's a beauty Chip, love the color and that glaze, very very gorgeous! 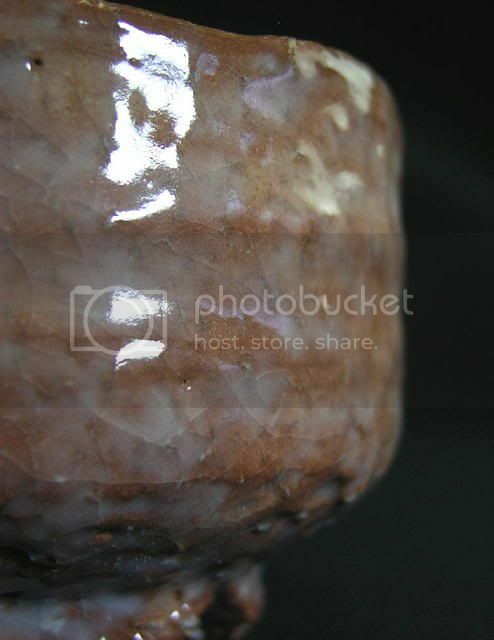 mmmm looks like glazed muffins or doughnut holes. Delicious. Love the Hagi. I'm always tempted by new pieces, and deterred by shipping. I think I've posted my Hagi pics here at various times, but they can all be seen here. I've got my eye on a couple of pieces at the moment, but haven't "jumped" yet because I'm trying to decide between them and a tokoname kyusu that I really want. Heh. "Gear Acquisition Syndrome," i haz it. GeekgirlUnveiled wrote: Love the Hagi. I'm always tempted by new pieces, and deterred by shipping. Chip, take note, I think me sees a TeaDay Poll Topic here! Shelob wrote: Chip, take note, I think me sees a TeaDay Poll Topic here! Hagi is a love or hate kind of thing; there are some pieces that I love, and quite a few other's that I don't care for at all. +1 Chip, you make me laugh, you are sooo silly and witty too! Last edited by Shelob on Feb 28th 09 5:48 pm, edited 1 time in total. Herb_Master wrote: You are noted and quoted as a lover of Oolong. I like the look of some of the Hagi that has been shown, and find others look a bit clumsy. Yet, as others have observed, repeated viewing does tend to make even the clumsier looking ones appear more and more inviting. I think I probably agree with how you feel about the chunkier pieces. But since I don't own one (yet) I won't be too harsh on them, only to say I prefer the more uniformly smooth coated ones. Also being a porcelain lover, I really do prefer a thinner lip. My new flared cups are PERFECT! I am drinking from one right now. Although I replaced my broken work yunomi with the same style, I feel these flared cups are really more me. This is the ultimate size and shape for me. This one is 3.25" across and 2.5" tall, holding about 4.5oz. I like the more open top and the lip slightly flared out. I most definitely use it for Green Oolongs!!! And here is where some may disagree, but I use it for black teas too. Obviously you would not let a black tea sit in there for any long period of time. But to now to reveal the mystery - the "change" that occurs over time with these pieces is that the white glaze begins to finely crackle, similar to celedon. Since the tiny cracks are usually brownish - I really don't see a problem drinking dark oolongs or even black teas. You are just helping the process along. Again, I wouldn't leave any black tea standing in the cup. And this is all personal preference. To answer your last question, I think you are over thinking it - I have not had a problem with the bottom being cool. 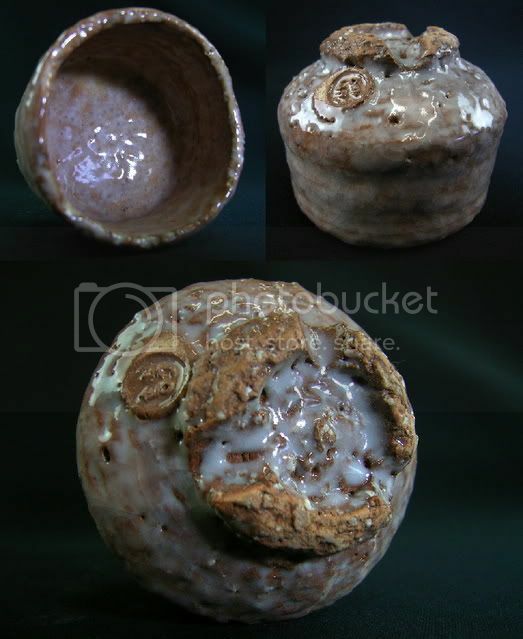 This is still clay and it insulates like any clay cup or pot would. It is just more porous. Thus the cup will sweat (or as we ladies say glisten) and possibly leak. My experience with leaking was minimal and I use a chataku anyway. It amounted to no more moisture than a condensation ring, I found it part of the charm really.